Protecting your desktops, laptops and mobile devices across all platforms has never been more convenient. You no longer need to order individual licences for all individual types of devices and operating systems - the unique ESET Unilicense system gets you up and running quickly. 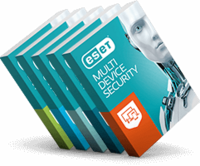 For example, if you have 2 computers and 2 mobile devices running a mix of Windows, Android & Mac you can just purchase a single 4 user licence for your desired ESET product. You can then install the appropriate version of the product for each operating system, using the same licence to provide protection to all devices. You can transfer protection to another device at any time without the hassle of getting new license. You can easily check your license usage through our License Manager site at my.eset.com portal.